Es Cubells. Sleeps 6 adults - Comfortable, well-equipped villa with amazing sea views, just a few minutes from the village Es Cubells. This villa sleeps up to 6 adults. Boasting beautiful sea views, this bright and airy villa has everything you need for a wonderful holiday. With three double bedrooms, all air-conditioned, it comfortably accommodates families or small groups. There is a fully equipped open plan kitchen and separate living room. Stepping out on the terrace you can enjoy breakfast with views right across to Formentera. There is a good sized pool with sun loungers and the spacious, covered BBQ area invites you to enjoy al fresco dining at any time of the day. This villa is ideal for small families or three couples looking for a quiet base on the island close to the sea. The pool is not fenced. The property is close to Cala d'Hort beach, where you can see the majestic Es Vedra and only 8km from Cala Jondal with it's legendary beach bars. 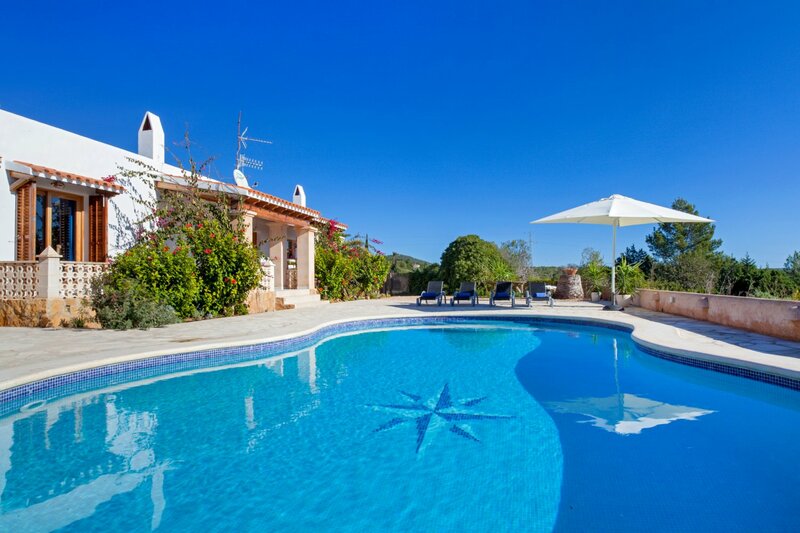 This wonderful villa also offers the opportunity to enjoy/discover the stunning scenery all along the South of Ibiza. The villages Es Cubells (1 km) and San José (5.6 km), with their great collection of bars and restaurants, are close by, or, if you fancy a night out both San Antonio and the island's capital and night life centre Ibiza are a 20-25 min drive away. Arrival day flexible. There is a 7-night minimum stay requirement in high season.